I hope you’ve enjoyed this year’s Money Memoir Series! Having real, open conversations about money is such an honor for me — and truly part of my life mission. I love creating safe spaces for people from all backgrounds and walks of life to share about their unique money stories. The hard stuff and what it taught them. Practical tidbits and deep spiritual wisdom. If YOU are inspired to pour more love, honesty, and smarts into your money relationship in 2019, please check out The Art of Money. My year-long money school starts in 3 days! We’d love to welcome you! Join here. The Art of Money is the ultimate expression of my 18 years of experience guiding individuals, couples, and creative entrepreneurs into happier, refreshingly honest relationships with money. I started this work years ago because I saw how much suffering, confusion, and stress most of us carry around money. I saw deep, emotionally aware people rocking out in every other area of their lives … except money. And I saw people having big “ah-ha” insights about their patterns with money … but struggling to integrate them into their lives in a sustainable, rubber-meets-the-road way. True money transformation takes more than Personal Finance 101: it’s an emotional and embodied endeavor, too. And making change stick takes more than ah-ha moments: we need concrete, day-to-day practices. That’s why I created a year-long program, including everything you need to create a deeper, savvier, happier relationship with money. The Art of Money is a year-long money school. A global community. A holistic framework. And quite simply: the best way I know to create sustainable, loving transformation in your money relationship. My entire 3-phase methodology, rolled out step-by-step. Direct access to me in our private Facebook group and our monthly group coaching calls. My wonderful team of wise, supportive TA’s (Transformational Assistants!). A global community of people from all walks of life, sharing this journey with you (this is gold). Fabulous Guest Teachers sharing money wisdom about everything from couples’ communication to student loan debt to savvy creative entrepreneurship to Enneagram and body-based healing. My whole team cheering you on and keeping you going. A monthly payment option (which I haven’t raised for 7 years) to make this as accessible as possible. It sounds hokey, but the Art of Money course has changed my life. After 16 years of intense therapy and lots (and lots) of change, I felt like I was ready for something bigger. I was pretty unconscious about my money issues when I heard about Bari, but was intrigued by her work. Going through the AOM program each month with Bari’s gentle but firm questioning technique allowed me to uncover areas of shame and undervaluing myself (many of which that had NOTHING to do with money). Feel successful and mature about money — whatever that means to YOU. Move through stuck places, anxiety, and procrastination (without being mean to yourself). Empower yourself with the practical financial education most of us never got. Turn your money relationship into an expression of your creativity, gifts, and deepest values. Claim your value and release old patterns and wounds. Make friends with money, so it can support the expression of your life goals, gifts, and dreams. This is THE way to work with me in 2019. I pour everything I’ve got to this program: 18 years of experience guiding thousands of individuals, couples, and creative entrepreneurs into refreshingly honest and empowered relationships with money (and a decade of training as a somatic psychotherapist and work in the mental health and hospice fields before that). What would it be like if you spent a year on your money relationship? Take my hand. Join the movement. I would be honored to welcome you to our global community. Join us right here. 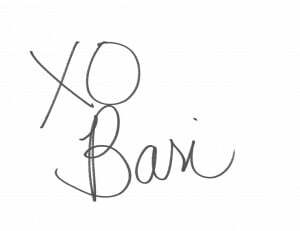 I’m not really sure I will ever truly find the right words to express my deep gratitude for having found Bari’s work and for the year I have spent as part of the AOM community. This program has RADICALLY shifted my relationship with money and even how I see myself. I broke through some barriers that had held me back for a long time. I even launched out and started my own business which I NEVER would have been able to do if I had not changed how I related to money. This program was a gift from the Divine at a time when I needed it the most. Getting honest about money takes guts. And a ton of support. P.S. Want to hear more from people who’ve gone through for The Art of Money? Bask in the glow of real money transformation right here. Full recording of the Facebook Live event yesterday. Sorry if you couldn’t get on! You don’t have to do money healing alone. Meet my 4 wise Teaching Assistants. Can I buy you a Money Mocha? + Art of Money 2019 Is Now Open!